Kadima council chairman and former MK Haim Ramon announces resignation because of the unity government. 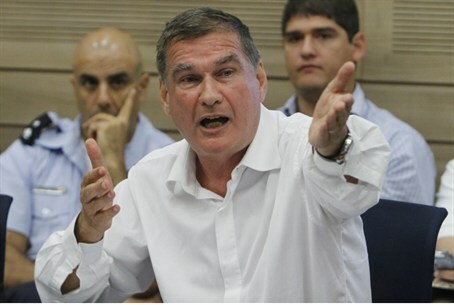 Kadima council chairman Haim Ramon informed party chairman Shaul Mofaz on Wednesday that he is resigning and leaving the party. Ramon's resignation was due to his party’s joining a unity government with Prime Minister Binyamin Netanyahu. The last minute surprise move came on Monday night as the Knesset was preparing to dissolve and hold elections. Ramon, who served as an MK for the Labor party on and off between 1991 and 2005, was one of the founders of Kadima and the first MK from Labor to join then-Prime Minister Ariel Sharon when he split from the Likud and joined Kadima. He was later appointed Justice Minister in former Prime Minister Ehud Olmert’s government. Ramon resigned from the Knesset in 2006 after he was indicted for indecent assault. He was later convicted and sentenced to community service, but the court did not find moral turpitude in his actions. Ramon returned to the government in 2007 and resigned from the Knesset in 2009, remaining only on the Kadima council. Ramon’s resignation came several hours after the Knesset approved the government's request to appoint Mofaz a government minister and deputy prime minister. During the Knesset debate, opposition MKs Uri Ariel (National Union) and Yitzhak Herzog (Labor) demanded that, as required by law, the entire agreement that was signed between Netanyahu and Mofaz be presented to the Knesset, including any secret clauses. Their demands forced Netanyahu to admit that while there hadn’t been any secret clauses in the agreement, he and Mofaz had reached some agreements orally. These may include promises by Netanyahu to Mofaz that Kadima members may be appointed as ministers in the future. Ramon’s resignation may be another expression of the anger and frustration directed by the public at Mofaz for joining the coalition. On Tuesday evening, several protests were held against the newly formed unity government, but most of the anger was directed at Mofaz and not as much at Netanyahu. A Channel 10 poll released Tuesday showed that the unity government did not have much of an effect on Netanyahu’s popularity. Most people – 43 percent – said they believe Netanyahu is best suited to serve as Prime Minister. Mofaz, Netanyahu’s newest coalition partner, came in last with only five percent of respondents thinking he would be suited to serve as Prime Minister.